Descriptors: caregivers, older adult, psychological stress, validation studies, geriatric nursing. Descritores: cuidadores; idoso; estresse psicológico; estudos de validação; enfermagem geriátrica. The degree of burden related to the demands of daily care provided to a dependent older adult is important to evaluate due to the negative influence exerted on caregivers' physical and psychological health. OBJECTIVE: To analyze the validity of the 12-item version of the Zarit Burden Interview administered to older caregivers of community-dwelling older dependent individuals and suggest a cut-off score based on quartiles. METHODS: Three hundred and forty-one older caregivers (mean age: 69.6±7.1 years; 76.8% women) registered with primary healthcare centers were evaluated using the ZBI-12. Additional evaluations addressed stress (Perceived Stress Scale [PSS]), depressive symptoms (Geriatric Depression Scale [GDS]) in the older caregivers and the degree of dependence of the older care recipients (Lawton and Brody [L&B]). RESULTS: Cronbach's alpha demonstrated very good internal consistency (α=0.81). Correlations were found between all ZBI-12 items and overall score on the PSS (r=0.53; p<0.01). GDS (r=0.43; p<0.01) and L&B (r= -0.23; p<0.01) scale scores. The PSS demonstrated the strongest correlation with ZBI-12 score and proved to be the standard reference. Based on caregivers with a higher degree of stress considering the PSS score quartiles, a cut-off score of 13 points on the ZBI-12 is suggested for screening burden in community-dwelling older caregivers, but should not be assumed as normative data. CONCLUSION: The ZBI-12 can be considered valid for evaluation of burden in clinical practice and research as a fast, efficient option for screening burden among older caregivers of community-dwelling older adults. O grau de sobrecarga relacionado às demandas do cuidado diário ao idoso dependente é uma importante medida a ser avaliada por influenciar de modo negativo na saúde física e psicológica do cuidador. OBJETIVO: Analisar a validade da Zarit Burden Interview versão 12 itens (ZBI-12) em idosos cuidadores de idosos da comunidade e sugerir nota de corte de acordo com quartis. MÉTODOS: Foram avaliados 341 idosos cuidadores (M=69,6±7,1 anos; 76,8% feminino) cadastrados na Estratégia Saúde da Família utilizando a ZBI-12. Adicionalmente, foram realizadas avaliações de estresse (Escala de Estresse Percebido [PSS]) e de sintomas depressivos (Escala de Depressão Geriátrica [GDS]) no idoso cuidador, e avaliada a dependência dos idosos receptores de cuidado (Escala de Atividades da Vida Diária de Lawton e Brody [L&B]). RESULTADOS: As análises por alfa de Cronbach mostraram consistência interna de α=0.81. Foi encontrada correlação entre todos os itens da ZBI-12 e do escore geral com os escores de PSS (r=0,53; p<0,01), GDS (r=0,43; p<0,01) e L&B (r= -0,23; p<0,01). Especificamente, a PSS obteve associação mais estreita com o escore da ZBI-12, se mostrando o padrão-referência. Considerando a divisão por quartil da PSS, para os cuidadores mais estressados, sugere-se nota de corte de 13 pontos na ZBI-12 para rastreio da sobrecarga em idosos cuidadores da comunidade em geral. CONCLUSÃO: A ZBI-12 apresentou boa consistência interna e pode ser considerada válida nessa população. Espera-se que o instrumento auxilie na avaliação da sobrecarga na prática clínica e na pesquisa e se torne uma alternativa de aplicação rápida e eficiente no rastreio de sobrecarga entre cuidadores mais velhos na comunidade. Assessment tools are important for the evaluation of burden among caregivers of community-dwelling older adults with diverse comorbidities, as physiological ageing can contribute to an increase in the number of chronic diseases.20 Short versions facilitate the application of these assessment tools at healthcare services and in studies,11 especially in populations from middle and low-income countries. These versions also help support interventions and actions proposed by health professionals aimed at reducing burden, thereby contributing to the physical and psychological health of caregivers. The aim of the present study was to analyze the internal consistency and validity of the ZBI-12 in caregivers of community-dwelling older adults and suggest a cut-off score based on standard reference assessment tools. The hypothesis is that the ZBI-12 has good internal consistency and is correlated with other assessment tools that address the psychological wellbeing of caregivers. The present cross-sectional study was conducted in accordance with the Revised Standards for Quality Improvement Reporting Excellence (SQUIRE 2.0 - checklist) for the description of the results. The sample consisted of 341 persons who met the following inclusion criteria, aged 60 years or older; performed the role of caregiver of their elderly dependent family member living in the same household, and enrolled in one of the primary healthcare centers in the city of São Carlos, state of São Paulo, Brazil, located 235 km from the state capital. The exclusion criterion of the research was refusal by the participant to sign the Free and Informed Consent Form. The degree of dependence of the elderly dependent on care was verified using the evaluation of the level of dependence for basic and instrumental activities of daily living analyzed by the Katz Index and Lawton and Brody's Scale. The data were collected by an oral interview, where carers with cognitive deficits were excluded with self-report. Therefore, interviewees who could understand and complete the data collection instruments were selected for the study.  Zarit Burden Interview: the ZBI-22 was developed by Zarit, Reever and Bach-Peterson in 1980 and was translated and validated for use in Brazil by Scazufca in 2002.21 The 22 items address the perceived impact of the act of providing care on the physical health, emotional health, social activities and financial situation of the caregiver. Each item has five response options ranging from "never" to "nearly always". Twelve of these items were extracted for use in the present study, proposed by Bedard et al.11 and are listed in Chart 1.  Geriatric Depression Scale (GDS): the GDS was developed to screen mood disorders in older adults and has been translated and validated for use in Brazil.23 The 15-item scale was employed (GDS-15)23 where a score of 6 points or more indicates the presence of depressive symptoms and a score of 11 points or more characterizes severe depressive symptoms. This study was conducted in accordance with all ethical precepts that govern research involving human subjects and received approval from the Human Research Ethics Committee of the Universidade Federal de São Carlos (certificate numbers: 416.467/2013 and 711.592/2014). All participants signed a statement of informed consent prior to the onset of the data collection process, and the care recipients that were completely dependent (13.5%) were consented by the legal guardian, who was predominantly represented by the caregiver. The data were entered in a double-blinded dataset in MS Excel 2010. The SPSS program version 21.0 (IBM, Chicago, Illinois, USA) was used for the data analysis. The data presented adherence to normality, as verified by the Kolmogorov-Smirnov test, and therefore parametric statistical tests were run. Descriptive statistics were performed to describe the sample (Table 1). Internal consistency of the ZBI-12 was measured using Cronbach's alpha, considering α > 0.8 to be indicative of very good to excellent internal consistency. Correlation coefficients were calculated for the item-item and item-score evaluations to determine the strength of the internal correlation of each item. Pearson's correlation coefficients were calculated to analyze the strength of correlations between the ZBI-12 items and total GDS, PSS and L&B scale scores for the determination of the standard reference (Table 2). To suggest a cut-off point for the ZBI-12, the PSS scores were divided into quartiles and four groups created. For each group, the mean and standard-deviation of ZBI-12 were reported. The mean value on the ZBI-12 for the highest group was the suggested cut-off point (Table 3). One-way ANOVA with Tukey's post hoc test was used for the comparison of mean ZBI-12 scores according to the PSS quartiles. A p-value ≤ 0.05 was considered indicative of statistical significance. Of the 341 caregivers, 57.8% were between 60 and 69 years of age, 76.8% were women and the majority had a low level of education (Table 1). The caregivers provided care for an average of 6.1±4.8 hours per day and did not receive any financial/material support for the costs related to care (83.9%) or any emotional/affective (53.9%) support from other family members or friends for care. Most caregivers had provided care for less than five years (75.2%). The profile of the care recipient was typically male (70.4%) and aged 73.6±8.5 years (38.7% between 60 and 69 and 39.0% between 70 and 79 years). Mean education was 3.4±3.6 years (56.2% had one to four years of study and 25% never went to school), which is similar to that of the caregivers. Table 2 shows the correlations between the ZBI-12 items and the other assessment tools administered. The strongest correlations were with the PSS, with all ZBI-12 items correlated at the 99% significance level. Therefore, the PSS was considered the standard reference. 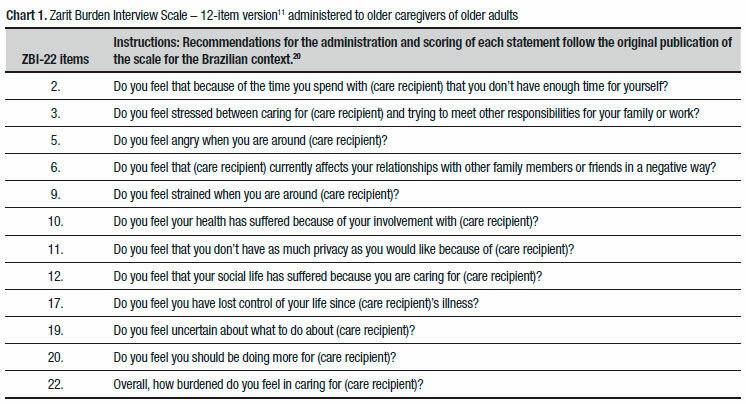 Based on the mean position in the ranking, Items 2 ("Do you feel stressed between caring for [care recipient] and trying to meet other responsibilities for your family or work? "), 6 ("Do you feel your health has suffered because of your involvement with [care recipient]?") and 9 ("Do you feel you have lost control of your life since [care recipient]'s illness?") were the most strongly correlated with the other assessment tools, whereas Items 4 ("Do you feel that [care recipient] currently affects your relationships with other family members or friends in a negative way?") and 11 ("Do you feel you should be doing more for [care recipient]?") had the weakest correlations, which is in agreement with the validation study of the original short version of the ZBI. The mean of the internal correlations among the items was 0.28 (range 0.03 to 0.67). The item-total score correlation ranged from 0.40 to 0.67. Item 11 had the weakest correlation and Items 2 and 6 had the strongest correlations. Cronbach's alpha demonstrated very good internal consistency (α=0.81). Table 3 displays the mean values on the scale for each group stratified by quartiles according to the PSS. The mean scores among the groups differed significantly (ANOVA), with higher ZBI-12 scores found among individuals subdivided in quartiles of PSS. 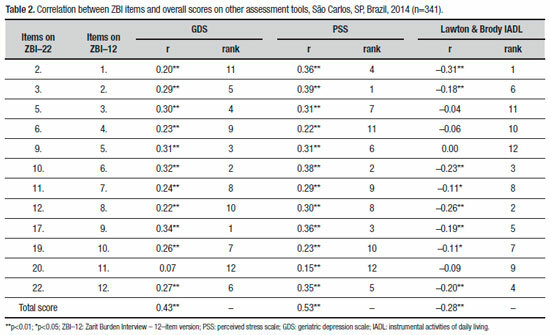 Based on the highest quartile of PSS, a cut-off of 13 points on the ZBI-12 can be suggested for use when screening burden in community-dwelling older caregivers in Brazil. The different cut-off points underscore the need for further studies for the identification of normative data that can be used to define high and low degrees of burden among caregivers in different age groups and who provide care for individuals with different degrees of dependence. Studies that evaluate predictors of burden in caregivers of older adults with dementia reveal that behavioral symptoms of the care recipient are among the factors that increase the level of burden in the caregiver.33 Brazilian researchers used the ZBI to compare the degree of burden in 20 caregivers of older adults divided into two groups of ten. In both groups, the care recipients were bedridden and highly dependent, but only one group of patients had dementia. The mean score for the caregivers of older adults without dementia was 30.4 and the score for caregivers of older adults with dementia was, on average, 18.8 points higher, a statistically significant difference (p=0.006).34 A higher degree of burden in caregivers of older adults with dementia has also been identified in international studies that used the ZBI-12. In a study conducted with 194 caregivers of individuals with dementia in different age groups that resided in rural communities in Canada, the researchers found a cut-off point of 14.19 for the evaluation of burden.15 The study in which the ZBI-12 originated involved a sample of caregivers of older adults, the majority of which had dementia, and found a cutoff point of 17.11 Differences in the care context and populations may contribute to different degrees of caregiver burden, which underscores the need for studies that establish a cut-off point for the evaluation of burden using the ZBI-12, specifically for caregivers of older adults with dementia. The degree of burden related to the demands of daily care provided to a dependent older adult is important to evaluate due to the negative influence exerted on physical, psychological and cognitive health and has driven the development of care models directed at caregivers themselves.7,40-42 In Brazil, the majority of studies that evaluate burden in family caregivers of community-dwelling older adults use the ZBI. Studies evaluating caregiver burden using the ZBI-12 have been conducted with different age groups. In a study conducted in Australia to evaluate the impact of the behavior of patients with amyotrophic lateral sclerosis and motor disability on caregiver burden, most caregivers were women (69.3%) and mean age was 60.8± 12 years.31 In a Belgian study exploring aspects associated with burden in informal caregivers of older adults with cognitive impairment, mean age was 60.9 ±13.3 years.32 In the present study, however, the sample was composed exclusively of older caregivers. This study has particular importance for the identification of burden in community-dwelling older caregivers. A fast, effective evaluation of the perceived burden of caregivers especially in the primary care context in Brazil, can lead to the identification of the older caregiver population at risk of complications and adverse outcomes.41-43 However, this study is not without limitations, the sample was composed only of older caregivers with specific characteristics, which limits the generalization of the findings and the ZBI-12 cutoff. This sample comprised older female and male caregivers in an inner city community of Brazil. They were supporting for their loved ones in at least on dependence of activity of daily living and the results should be interpreted considering this profile. Nonetheless, the results can serve as a starting point for reflections and further studies involving the ZBI-12. The present study analyzed the internal consistency and validity of the ZBI-12 administered to older caregivers of dependent older adults living in the community. The results show that the measure has good internal consistency and can be considered valid for this population. Moreover, a cut-off point of 13 is recommended for the determination of a high degree of burden, but should not be assumed as normative data. These findings can serve as the basis for subsequent studies that seek to suggest data for caregivers in different age groups that provide care to individuals with different degrees of dependence. Authors contributions. All the authors have contributed to the manuscript preparation and conceptualization. Financial Support. CAPES and CNPq. 1. Bastawrous M. Caregiver burden? A critical discussion. Int J Nurs Stud. 2013;50:431-41. 2. Gratão ACM, Vendrúscolo TRP, Talmelli LFS, Figueiredo LC, Santos JLF, Rodrigues RAP. Burden and the emotional distress in caregivers of elderly individuals. Texto Contexto Enferm. 2012;21(2):304-12. 3. Bianchi M, Flesch LD, Alves EVC, Batistoni SST, Neri AL. Zarit Burden Interview psychometric indicators applied in older people caregivers of other elderly. Rev Latino-Am Enfermagem. 2016;24:e2835. 4. Buyck JF, Bonnaud S, Boumendil A, Andrieu S, Bonenfant S, Goldberg M, et al. Informal caregiving and self-reported mental and physical health: results from the Gazel Cohort Study. Am J Public Health. 2011;101(10):1971-9. 5. Adelman RD, Tmanova LL, Delgado D, Dion S, Lachs MS. Caregiver burden: a clinical review. JAMA. 2014;311(10):1052-9. 6. Pinquart M, Sorensen S. Spouses, adult children and children-in-law as caregivers of older adults: a meta-analytic comparison. Psychol Aging. 2011;26(1):1-14. 7. Gratão ACM, Talmelli LFS, Figueiredo LC, Rosset I, Freitas CP, Rodrigues RAP. Functional dependency of older individuals and caregiver burden. Rev Esc Enferm USP. 2013;47(1):137-144. 8. Stewart NJ, Morgan DG, Karunanayake CP, Wickenhauser JP, Cammer A, Minish D, et al. Rural caregivers for a family member with dementia: models of burden and distress differ for women and men. J App Gerontol. 2016;35(2):150-78. 9. Zarit SH, Reever KE, Bach-Peterson J. Relatives of the impaired elderly: correlates of feelings of burden. Gerontologist. 1980;20(6):649-655. 10. Zarit SH, Orr NK, Zarit JM. The hidden victims of Alzheimer's disease: Families under stress. New York: New York University Press; 1985. 11. Bedard M, Molloy D, Squire L, Dubois S, Lever J, O'Donnell M. The Zarit Burden Interview: A New Short Version and Screening Version. Gerontologist. 2001;41(5):652-7. 12. Lai DW. Validation of the Zarit Burden Interview for chinese canadian caregiver. Soc Work Res. 2007;31(1):45-53. 13. Martin-Carrasco M, Otermin P, Perez-Camo V, Pujol J, Aguera L, Martin MJ, et al.  EDUCA study: Psychometric properties of the Spanish version of the Zarit Caregiver Burden Scale. Aging Ment Health. 2010;14(6):705-11. 14. Kumamoto K, Arai Y, Ueda T, Washio M. Cross-validation of the short version of the Japanese version of the Zarit Caregiver Burden Interview (J-ZBI_8). Nihon Ronen Igakkai Zasshi. 2004;41(2):204-10. 15. Branger C, O´Connell ME, Morgam DG. Factor analysis of the 12-item Zarit Burden Interview in caregivers of persons diagnosed with dementia. J Appl Gerontol. 2016;35(5):489-507. 16. Stagg B, Larner AJ. Zarit Burden Interview: pragmatic study in a dedicated cognitive function clinic. Prog Neurol Psychiatry. 2015;19(4):23-7. 17. Yu J, Yap P, Liew TM. The optimal short version of the Zarit Burden Interview for dementia caregivers: diagnostic utility and externally validated cutoffs. Aging Ment Health. 2018:1-5. 18. Rajabi-Mashhadi MT, Mashhadinejad H, Ebrahimzadeh MH, Golhasani-Keshtan F, Ebrahimi H, Zarei Z. The Zarit Caregiver Burden Interview Short Form (ZBI-12) in spouses of veterans with chronic spinal cord injury, validity and reliability of the persian. Arch Bone Jt Surg. 2015;3(1): 56-63. 19. Lin CY, Wang JD, Pai MC, Ku LE. Measuring burden in dementia caregivers: confirmatory factor analysis for short forms of the Zarit Burden Interview. Arch Gerontol Geriatr. 2017;68:8-13. 20. Campolina AG, Adami F, Santos JLF, Lebrão ML. The health transition and changes in healthy life expectancy in the elderly population: possible impacts of chronic disease prevention. Cad Saúde Pública. 2013;29(6):1217-29. 21. Scazufca M. Brazilian version of the Burden Interview scale for the assessment of burden of care in carers of people with mental illnesses. Rev Bras Psiquiatr. 2002;24(1):12-17. 22. Luft, CB, Sanches, SO, Mazo, GZ and Andrade, A. (2007). Brazilian version of the Perceived Stress Scale: translation and validation for the elderly. Rev Saúde Pública. 2007;41(4):606-15. 23. Almeida, OP, Almeida, SA. Reliability of the Brazilian version of the geriatric depression scale (GDS) short form. Arq Neuropsiquiatr. 1999; 57(2B):421-6. 24. Lawton MP, Brody EM. Assessment of folder people: self-maintaining and instrumental activities of daily living. Gerontologist. 1969;9:179-86. 25. Santos RL, Virtuoso Júnior JS. Reliability of the brazilian version of the scale of instrumental activities of daily living. RBPS 2008;21(4):290-6. 26. Ballesteros J, Santos B, González-Fraile E, Muñoz-Hermoso P, Domínguez-Panchón AI, Martín-Carrasco M. Unidimensional 12-item Zarit Caregiver Burden Interview for the assessment of dementia caregivers' burden obtained by item response theory. Value Health. 2012;15(8): 1141-7. 27. Tang JY, Ho AH, Luo H, Wong GH, Lau BH, Lum TY, et al. Validating a Cantonese short version of the Zarit Burden Interview (CZBI-Short) for dementia caregivers, Aging Ment Health. 2016;20(9):996-1001. 28. Higginson IJ, Gao W, Jackson D, Murray J, Harding R. Short-form Zarit Caregiver Burden Interviews were valid in advanced conditions. J Clin Epidemiol. 2010;63(5):535-42. 29. Malik FA, Gysels M, Higginson IJ. Living with breathlessness: A survey of caregivers of breathless patients with lung cancer or heart failure. Palliat Med. 2013;27(7):647-56. 30. Lillo P, Mioshi E, Hodges JR. Caregiver burden in amyotrophic lateral sclerosis is more dependent on patients' behavioral changes than physical disability: a comparative study. BMC Neurol. 2012;12:156. 31. Mello JA, Macq J, Van Durme T, Cès S, Spruytte N, Van Audenhove C, et al. The determinants of informal caregivers' burden in the care of frail older persons: a dynamic and role-related perspective. Aging Ment Health. 2017;21(8):838-43. 32. Brodaty H, Woodward M, Boundy K, Ames D, Balshaw R. PRIME Study Group. Prevalence and predictors of burden in caregivers of people with dementia. Am J Geriatr Psychiatry. 2014;22(8):756-65. 33. Pinto FNFR, Barham EJ. Psychological wellbeing: comparison between caregivers of older adults with and without dementia. Psic Saúde Doenças. 2014;15(3):635-55. 34. Gallagher-Thompson D, Power DV. Primary stressors and depressive symptoms in caregivers of dementia patients. Aging Ment Health. 1997;1:248-55. 35. Sutter M, Perrin PB, Chang YP, Hoyos GR, Buraye JA, Arango-Lasprilla JC. Linking family dynamics and the mental health of Colombian dementia caregivers. Am J Alzheimers Dis Other Demen. 2014;29(1): 67-75. 36. Luchesi BM, Souza ÉN, Gratão AC, Gomes GA, Inouye K, Alexandre Tda S, et al. The evaluation of perceived stress and associated factors in elderly caregivers. Arch Gerontol Geriatr. 2016;67:7-13. 37. Souza LR, Hanus JS, LIbera LBD, Silva VM, Mangilli EM, Simões PW, et al. Overload in care, stress and impact on the quality of life of surveyed caregivers assisted in primary care. Cad Saúde Colet. 2015;23(2):140-9. 38. Van der Lee J, Bakker TJ, Duivenvoorden HJ, Dröes RM. Multivariate models of subjective caregiver burden in dementia: a systematic review. Ageing Res Rev. 2014;15:76-93. 39. Loureiro LS, Fernandes Md, da Nóbrega MM, Rodrigues RA. Overburden on elderly's family caregivers: association with characteristics of the elderly and care demand. Rev Bras Enferm. 2014;67(2):227-32. 40. Stackfleth R, Diniz MA, Fhon JRS, Vendruscolo TRP, Fabrício-Whebe SCC, Marques S, et al. Burden of work in caregivers of frail elders living at home. Acta Paul Enferm. 2012;25(5):768-74. 41. Nardi EFR, Sawada NO, Santos JLF. The association between the functional incapacity of the older adult and the family caregiver's burden. Rev Latino-Am Enferm. 2013;21(5):1096-1103. 42. Brigola AG, Luchesi BM, Alexandre T da S, Inouye K, Mioshi E, Pavarini SCI. High burden and frailty: association with poor cognitive performance in older caregivers living in rural areas. Trends psychiatry Psychother. 2017;39(4):257-63. This study was conducted at the Department of Gerontology, Universidade Federal de São Carlos, São Carlos, SP, Brazil.